This Friday I am taking part in a panel discussion in the beautiful George Gilbert Scott-designed chapel at King’s College London, with Stuart Brisley and Maya Balcioglu and Dr Sanja Perovic. 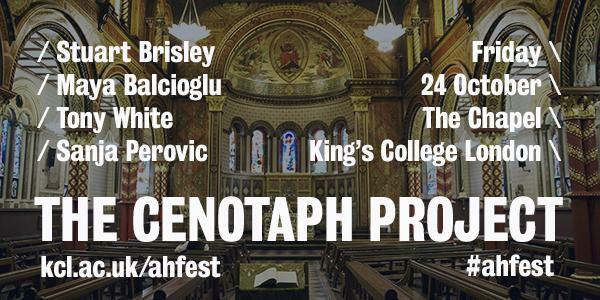 The event is part of the King’s College London Arts & Humanities Festival 2014: Underground, and is a rare opportunity to hear Brisley and Balcioglu in conversation, and to hear about The Cenotaph Project. In addition, as part of the proceedings I shall be reading a new short story published to mark the event, entitled ‘The Holborn Cenotaph’. A limited edition of fifty signed proofs will be published by Piece of Paper Press to mark the event. Here is the information taken from the A&H Festival brochure. Please click-through for the Eventbrite bookings page.